Made-to-measure wardrobes is a personalised storage solution. You can customise the look and the interior of the closet to your taste and needs. There are several good reasons why you should get a fitted wardrobe. Unlike a ready-to-buy wardrobe that projects from the wall, a fitted wardrobe utilises the little space there is to make more storage space. This type of wardrobe will fit into tight corners and take advantage of the full wall height from ceiling to floor. The whole idea behind a made-to-measure approach is to have your style, size and of course budget. Some people fear are mistakenly afraid when they come across ‘bespoke.’ But really the idea is that what you are getting is slightly different from the mass-produced goods in the market. Just because it is bespoke does not mean it comes with ebony and gold plating. You can have a reasonably costing wardrobe from high-quality materials or luxurious piece of interior, it all depends on your preferences. Although a fitted wardrobe can be removed and reinstalled while moving houses, in the majority of cases home owners leave it in the previous house, but it still might a worthy investment. It could add value to the house when are selling or renting it out. Whether you are installing a fitted closet in a large room or a small one the mirror sliding door wardrobe could be a great choice. 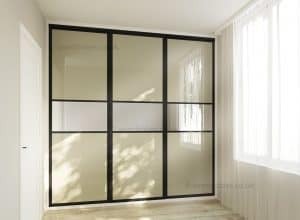 Sliding doors take less space to open and have a modern look. Mirrored panels add a touch of light and make the space look larger. They will also save you the need for a full-length dressing mirror. While there are many companies offering made-to-measure wardrobes, it is important to remember, that not all made-to-measure wardrobes are bespoke. In many cases, these are just getting smaller or larger to fit the space, while the design of it is already there and not created personally for you. At i-Wardrobes every wardrobe, walk-in closet and fitted bedroom is created in cooperation with the customer – from the materials, design of doors, interior till the handles and frame colour. Looking For the Perfect Walk-in Wardrobe?